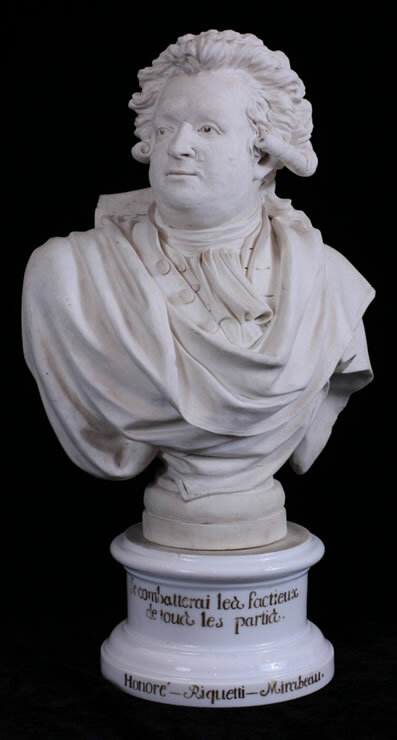 Rare Paris porcelain biscuit bust of Honoré Riqueti Mirabeau from the Faubourg Saint-Denis manufactory. The politician and orator, his face bearing scars of smallpox, looks to the right with a penetrating gaze. He is wearing a wig and an over-garment giving the impression of a toga. The bust rests on a round white glazed plinth inscribed on the body in gold: “Je combatterai les factieux de tous les parties.” (“I will fight seditionists of every party.”) and on the base: “Honoré Riquetti (sic) Mirabeau”. The porcelain factory on the Faubourg Saint-Denis, founded in 1771 by Pierre-Antoine Hannong, came under the protection of the Count d’Artois in 1779. In the 19th century, it became the Schoelcher factory.